Niccolls Memorial Presbyterian Church is taking orders for the Food Sense package for April 2016. Each “unit” costs $15.50. This program is open to all. There are no eligibility requirements nor is there any obligation to purchase food every month. This entry was posted in admin and tagged Food Sense, Niccolls Church on March 31, 2016 by Gina Greco. The Niccolls Church Women’s Fellowship invites the community join them in Operation Christmas Child, a charitable effort in support of disadvantaged children around the world. During the next couple of weeks, the women will be assembling gift boxes of toys, school and hygiene supplies and other items that can be sent to needy children during the holiday season. This entry was posted in admin and tagged Niccolls Church, Operation Christmas child on November 12, 2015 by Gina Greco. 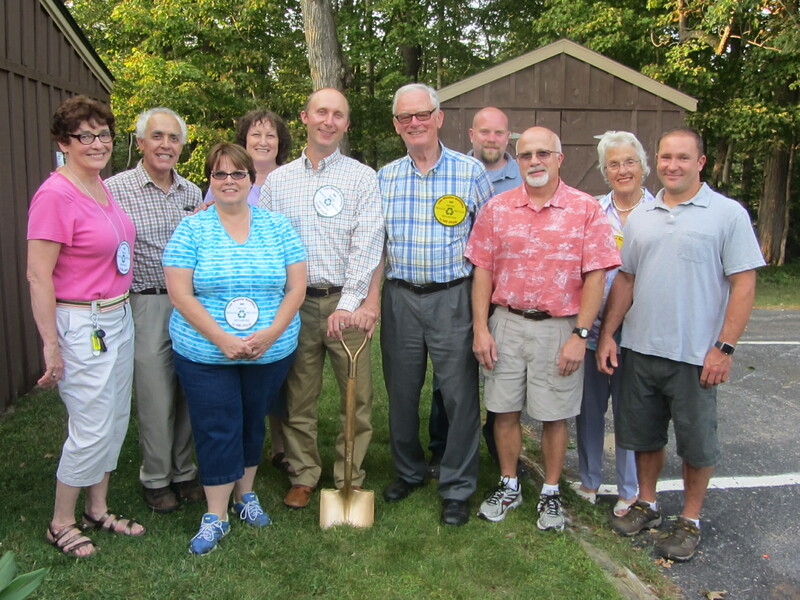 Groundbreaking for the new addition that will accommodate the Mission Boutique at Niccolls Memorial Church in Old Forge was held Thursday, September 3rd. The new 54’ by 30’ addition will allow for easy first floor access to the popular boutique, formerly known as the Thrift Shop, and expanded shopping space. It also includes a dressing room, a seasonal storage area, a sorting area, and public drop off space. The boutique, located in the basement of the church, currently operates in a space half the size. According to Mary Brophy-Moore, a member of the Mission Boutique Capital Campaign Committee, it is literally bursting at the seams due to the tremendous amount of donations of clothing and household goods it receives. She also noted that the basement location presented challenges for customers and volunteers with mobility issues as there is no elevator. The Mission Boutique is operated entirely by volunteers who sort through, display and sell the goods. It is unique in that 100% of the proceeds are used for outreach to local, regional and global not-for-profit programs. No monies are directed back to the church for operational expenses. Among the non-profit organizations that receive regular monetary and/or material support are: the Home Aide Service of the Central Adirondacks (HASCA); the Community Transpor-tation Service (CTS); Niccolls Board of Deacons, which maintains a 24-hour food pantry and emergency assistance for local and surrounding communities; Hope House of Utica, which provides daily meals for the homeless and hungry; and Central New York Veterans Outreach Program, which provides assistance to displaced veterans in the Mohawk Valley. Funds also assist Care Net, which provides free educational and health services for women and teens in the Mohawk Valley; Stevens-Swan Humane Society; Hands of Mercy, providing education for poor children in Bugala, Uganda; and disaster relief for victims of fires, floods, earthquakes or other natural disasters. The groundbreaking was made possible through the efforts of volunteers who raised funds throughout the summer by hosting a chicken barbecue and auction, pie sale, a Christmas in July event, and other initiatives. Once the building is framed in, a team of volunteer church members will donate their time to assist with the finish work. The goal is to raise $160,000 by June 2016, and until then the fundraising will continue. Anyone can help the cause by shopping or donating to The Mission Boutique or supporting Niccolls’ community fundraising events. The Boutique is currently open on Fridays from 10 a.m. to noon and 7 to 8:30 p.m. and Saturdays from 10 a.m. to noon. Volunteers are always welcome. Tax-deductible donations may be made payable to Niccolls Memorial Church; please note Mission Boutique Building Fund on memo line of check. Donations can be mailed to: Niccolls Memorial Presbyterian Church, P.O. Box 605, Old Forge, NY 13420. This entry was posted in admin and tagged expansion, mission boutique, Niccolls Church on September 3, 2015 by Marianne Christy. Niccolls Memorial Presby-terian Church is taking orders for the Food Sense package for August. Each “unit” costs $15.50. This program is open to all. There are no eligibility requirements nor is there any obligation to purchase food every month. This entry was posted in admin and tagged Food Sense, Niccolls Church on August 6, 2015 by Gina Greco. The Senior Health Activities Recreation Program (SHARP) and CAP-21, along with The Community Foundation of Herkimer & Oneida Counties, Inc. and The Health Foundation for Western and CNY, would like to learn more about needed programs that would enable people to remain in their own communities and live as independently as possible as they age. This entry was posted in admin and tagged Cap-21, Niccolls Church, program, SHARP on July 30, 2015 by nick rose. The volunteers at the Mission Boutique (formerly the Thrift Shop) of Niccolls Memorial Church will hold a Christmas in July Sale in the church’s Fellowship Hall on Wednesday, July 22 from 7 to 8:30 p.m., Friday, July 24 from 10 a.m. to noon and 7 to 8:30 p.m., and Saturday, July 25 from 10 a.m. to noon. This entry was posted in admin and tagged Christmas in July, Niccolls Church on July 16, 2015 by Gina Greco. The Mission Committee of Niccolls Memorial Presbyterian Church will host their semi-annual Alternative Marketplace at the church on Sunday, July 12 from 8 to 8:30 a.m. and again at 11 a.m. to noon. This entry was posted in admin and tagged Fair Trade sale, Niccolls Church on July 9, 2015 by Gina Greco.